As innovative and ingenious as most cryptocurrency projects are, there’s still one major challenge most of them struggle to overcome, and that is scalability. This is a problem that most complex and large crypto platforms are currently suffering from. Scalability can be defined as the network’s ability to process transactions in a predefined (or a shorter) period. Two of the most obvious examples are Bitcoin and Ethereum. In Bitcoin’s case, the enormous number of transactions that need to be processed has risen so much that the network has simply reached its limits. Hence, Bitcoin has one of the slowest and expensive transaction rates of any crypto project. While Ethereum’s case is a bit different, the results are pretty much the same, and the problem becomes more than evident when the whole ecosystem came to a halt for almost a week when the CryptoKitties craze kicked off in late December 2017. In short, the problem arises due to the fact that as the network grows, it becomes more difficult to reach consensus. However, there is one crypto platform that has been designed from the ground up to take into account this problem and to actually fix it in a very ingenious way. That project goes by the name of Zilliqa (ZIL). Zilliqa is an ambitious, new-age cryptocurrency project that relies on sharding as well as a technology that allows its blockchain to scale in a linear, unrestricted, and efficient fashion as the ecosystem grows in size. 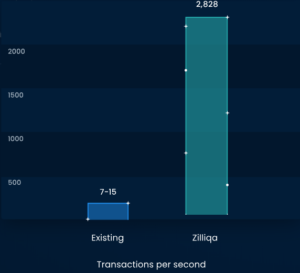 In theory, Zilliqa has no limits on the number of transactions it can process per second. What’s probably most impressive about Zilliqa is the fact that it manages to process tens of thousands of transactions per second (just like all the traditional digital payment solutions), all while still being able to run smart contracts on a sharded network. How does Zilliqa actually solve the scalability problem? In order to fix scalability, most blockchain projects increase the block size. This allows for more transactions to be confirmed in each consensus round. Another solution is to move the information of the blockchain. These measures, as effective as they may be in the short run, can’t solve the scalability problem. Zilliqa’s solution, on the other hand, fixes the scalability problem by allowing the entire architecture of the blockchain to be redesigned. This means that the network size and network speed are not directly or inversely linked. One easy way to think about it is that Zilliqa’s blockchain remodels its architecture from scratch. 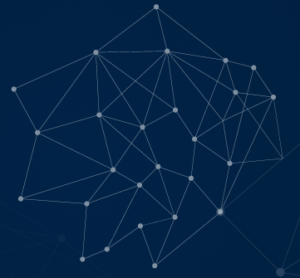 The platform uses a hybrid consensus protocol that increases throughput with every additional 600 nodes. Therefore, one of Zilliqa’s distinguishing features is the fact that it is linearly scalable, meaning that as the number of nodes on the network increases, the throughput increases at an almost linear rate. Zilliqa also makes use of a unique feature based on the concept of sharding. Sharding can be defined as the process through which the network is divided into smaller consensus groups called shards. Every shard is capable of processing transactions in parallel, allowing them to ultimately process more transactions. Just to give you an idea of how effective this technology is, in the early days of its Testnet, Zilliqa recorded a throughput 250 times higher than that of Ethereum. Each shard creates a microblock with all the transactions it processes. The Zilliqa Team called the end of the parallel processing period DS Epoch. DS Epoch means that the microblocks are combined to form a full block, which is concurrently added to the blockchain. Another concept worth discussing is that of the DS Committee. According to the Zilliqa Team, DS Epoch has a DS Committee. A DS Committee is a small group of randomly selected nodes that manage all the other shards- it basically decides which transactions get assigned to which shards. One of the most important features of Zilliqa is its consensus mechanism. It uses a Proof-of-Work mechanism that is only focused on establishing mining identities. Most interestingly, Zilliqa doesn’t rely on a traditional consensus protocol. Instead, it utilizes a Byzantine Fault Tolerant (pBFT) consensus protocol to allow more efficient management of storage requirements. To simplify the concept as much as possible, this consensus protocol makes it so that the entire transaction history does not have to be saved on the blockchain, which translates into more efficient management and storage requirements. The fact that Zilliqa has also created its own bespoke programming language should not come as a surprise, especially considering how innovative the platform is. The bespoke programming language called Scilla has the ability to separate the state and function of smart contracts, making functional programming more secure and standardized. The drawback of this particular programming language is the fact that it is not Turing complete. Hence, it cannot be used to create apps, especially apps that require conditional statements and various types of loops. As one can expect, Zilliqa also has its own token, called ZIL. The ZIL token has the same purpose as most tokens: it’s used to incentivize mining, as a means to pay transaction fees, and it can also be used as gas for contract execution. ZIL is an ERC-20 token, still running on the Ethereum blockchain. ZIL can be bought, sold, and traded on a great number of exchanges such as Binance, Upbit, Bithumb, KuCoin, and Huobi.pro. Of course, once Zilliqa’s mainnet will be launched, the token will be exchanged for native Zilliqa tokens. Zilliqa has recently launched its Testnet 2.0 and has made a great number of improvements. The team worked on improving infrastructure stability and offering better smart contract support. Additionally, users can now benefit from the Scilla wallet which will allow them to deploy their own smart contracts on their testnet. Even though the Mainnet launch was scheduled for the second and then the third quarter of 2018, the team postponed the launch to ensure the delivery of a high-quality product. The team is currently working hard for the Mainnet launch which will take place at the end of the year or in January 2019. Once its Mainnet is launched, there’s a good chance that Zilliqa will become even greater than it already is. The post Zilliqa- In-Depth Cryptocurrency Review appeared first on Coindoo - Crypto News and Reviews.